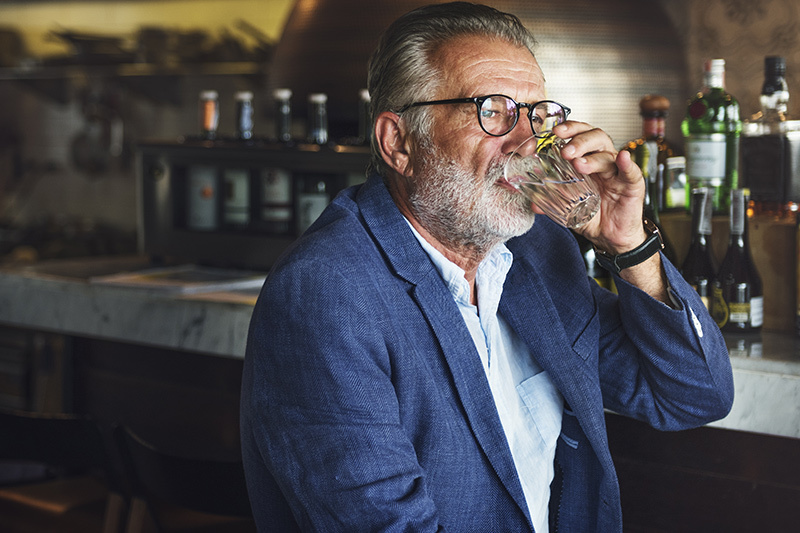 A majority of Americans ages 65 and older drink alcohol, and those who do are drinking more than older Americans in previous years, according to a study published this past spring in Alcoholism: Clinical & Experimental Research. The same study reported that binge drinking is also on the rise among seniors. What many of these older Americans don’t know, however, is how the biologics of drinking change as they age. What constitutes a safe daily intake for a younger person could pose a risk to someone in their golden years, who may eat less, weigh less, drink less water and take more medications. Below are details of this unique relationship between alcohol and older adults, along with tips for helping seniors with alcohol dependence problems. It has been said that “aging is not for sissies”. Growing older can often come with new life challenges and living constraints: the onset of chronic health issues that can bring with them loss of mobility and independence; the stress of caring for an ailing spouse or the grief of losing them to old age; a sense of boredom, loneliness or lack of purpose upon retirement; financial hardships. In such circumstances, alcohol can become a mechanism for coping. Consequently, someone who at most could be described as a “social drinker” all of their life can begin to drink routinely and in excess of the recommended daily drinking guidelines for Americans ages 65 and older. Just how prevalent is this phenomenon of later-life drinking and drinking in excess of healthy guidelines? Quite prevalent, researchers found in a 2009 study published in the journal Addiction. The researchers found that 49 percent of older women and 65 percent of older men engaged in excess alcohol consumption. More conservative estimates from the Substance Abuse and Mental Health Services Administration have put the number at 15 percent of men over the age of 60 and 20 percent of women over the age of 60. Multiply these numbers by the massive wave of baby boomers nearing retirement age, and the problem approaches epidemic levels. Health care providers, therefore, need to be prepared for the number of alcohol-related medical issues coming their way. Alcohol consumption at any level raised the risks of incurring an injury caused by others, and caused harmful effects when combined with medication. Changes in alcohol sensitivity and alcohol tolerance are other catalysts in an older adult’s evolving relationship with alcohol. As people age, the percentage of their body weight that consists of water decreases, and the percentage of body fat increases, with the result that alcohol intoxication happens more quickly. The rates of alcohol metabolism and excretion also decrease as an individual grows older, due to a slowdown in activity of a particular digestive enzyme in the stomach known as ADH. Lower ADH activity translates to higher levels of alcohol in the blood. The overall result, then, is heightened alcohol sensitivity and a lower tolerance level. What was once a moderate amount of alcohol, now can cause intoxication and related health risks. For older Americans who binge drink or routinely over-indulge with alcohol, the effects of alcohol abuse can be nothing short of deadly. A mind and body that are already more fragile from normal wear and tear will be quicker to succumb to these damaging effects—especially when an addiction goes untreated. The good news is that treatment can help. Contact a trusted doctor or the National Helpline, a free, 24/7 service of the Substance Abuse and Mental Health Services Administration, for a treatment referral: 1-800-662-HELP. Anna Ciulla is the Clinical Director at Beach House Center for Recovery where she is responsible for designing, implementing and supervising the delivery of the latest evidence-based therapies for treating substance use disorders. Anna has a passion for helping clients with substance use and co-occurring disorders achieve successful long-term recovery. “Trends in Alcohol Consumption Among Older Americans: National Health Interview Surveys, 1997 to 2014,” Wiley Online Library. “Older Adults’ Alcohol Consumption and Late-Life Drinking Problems: A 20-Year Perspective,” National Center for Biotechnology Information. “Older Adults and Alcohol Problems,” National Institute on Alcohol Abuse and Alcoholism (NIAAA). “Substance Abuse Among Older Adults: An Invisible Epidemic,” National Center for Biotechnology Information. “Older Adults,” National Institute on Alcohol Abuse and Alcoholism (NIAAA). “Self-reported alcohol consumption and falls in older adults: cross-sectional and longitudinal analyses of the cardiovascular health study,” National Center for Biotechnology Information. “Risks of Combined Alcohol-Medication Use in Older Adults” National Center for Biotechnology Information.